We all know the universal agreement on the long ageing ability of the cabernet sauvignon variety and especially quality Bordeaux wines and those increasingly popular “Bordeaux Blends”. However there is less consensus on pinot noir and particularly red Burgundy. 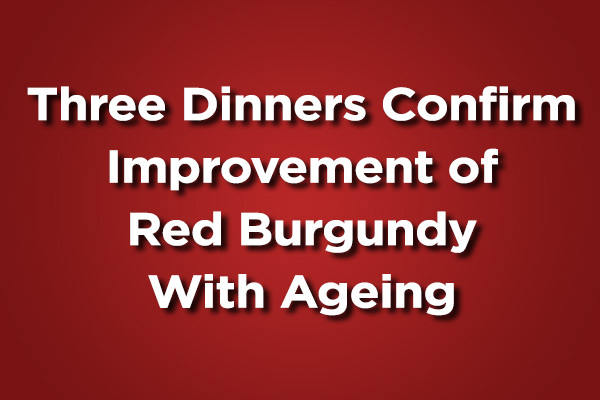 Believe there are several reasons for this including the scarcity of limited supply older red Burgundies available plus that many show a delicious accessible sweeter fruit for enjoyment when younger. In fact some consumers actually prefer the style of young fresh fruity pinot noir fruit to the changed version when older. However that usual endemic underlying acidity of red Burgundy (plus many other pinot noirs from around the world) well stored allows it to evolve slowly yet gracefully developing more complex bouquet with those unique seductive textures. Worth the wait IMHO! Three exciting dinner parties within the last 3 weeks featuring top Burgundy certainly emphatically confirmed this opinion for your scribe. The first was a vertical of ECHEZEAUX Grand Cru from a rather large 37+ hectares (11 distinct climats) producing some 12,000+ cases per year by 84 owners with the largest DRC followed by Mongeard-Mugneret. The young 2013 from Fabrice Vigot surprised with lovely exquisite bright perfumed pinot noir aromas and powerful taste. Enjoyable already. However the 10 years older 2003 Domaine de Perdrix was also still youthful but developing richer style from blacker fruits of a hot year especially in the enhanced flavours. Better still were 93 DRC so structured just coming into its own exotica at 25 years plus the two 1988s (originally a year of prominent acid & tannins) of DRC (open complex enticing soy oriental spice) and Mongeard-Mugneret (mature lighter so elegant showing typical leather with sous-bois). Good food pairing of local Quail with butternut squash, baby kale, pomegranate, toasted hempseed hearts. 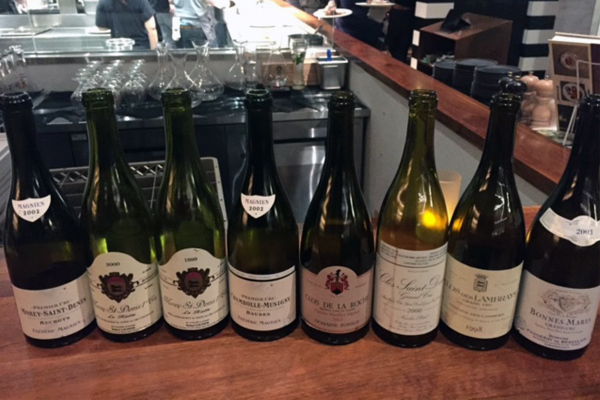 Second evening featured nine VOSNE-ROMANEE all from Dominique Laurent. 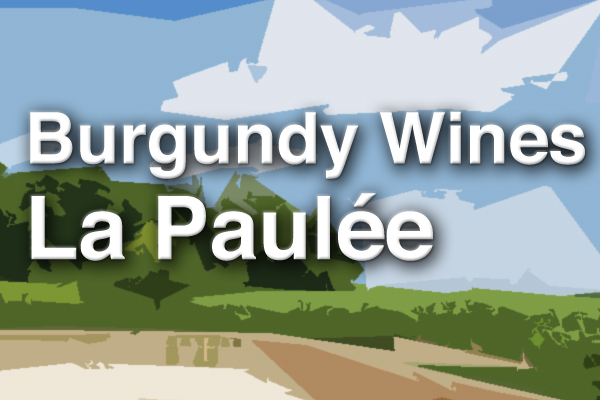 A region of 8 Grand Cru (including Echezeaux & Grands-Echzeaux both in Flagey-Echezeaux) over 75 hectares, 12 Premier cru (plus 2 in F-E) in 58 hectares & Villages over 105. Premier Crus Les Suchots 2008 proved best over more forwardly two Les Beaumonts 2008 and deeper darker 2007. The six distinct parcels all 1995 were developing better with more age: La Croix Blanche (most southerly by the RN 74) dark but a bit green stems, Le Croix Rameau 1er cru (NE corner RSV) palest silky most finesse, Les Champs Perdrix (above La Tache next to Reignots) mid colour full & rich, Les Petits Mont 1er cru (above La Romanee, Richebourg) best of show amazingly complex with special velvet textures, Les Hautes-Maizieres Serie Rare (below Les Suchots) youthful edgy spritzy, and Serie Rare Cuvee Royale (assorted villages) forwardly but a simpler terroir. Recommended dishes that worked so well with these wines were sustainable Gindara Sablefish (good rich oily texture works), celery roots & hearts, black truffle jus, blood orange, brown butter powder and also Tonka Bean smoked sea salt roasted duck breast (classic pairing), BC blueberry, parsnips, and vanilla emulsion. Third dinner party was a joy celebrating freshly shot wild duck with Autumn fruits and top Burgundy. Also fantastic matches were North Coast Brill Sole & Sidestripe shrimp with sunchoke puree in red wine shellfish reduction (red wine with fish worked again! )plus Braised lamb shoulder with subtle Moroccan spices, almond & apricot couscous. Younger Grand Cru all were remarkable of ROMANEE ST. VIVANT DRC 2004 (14754 bottles) picked end of September & structured 2003 (11924b) early end of August with very low yields & Rousseau CHAMBERTIN 2003 & 2000 (both big rich licorice) plus their more delicate aromatic Clos de Beze 2001. Again the older selections showed the most outstanding with both 1990s impressive showing darker most elegant DRC RSV and evolving colour yet exciting honey-licorce of Chambertin by Rousseau (actually prefer their 1991). Another treat this evening which emphasized age worthiness at 40 years was that famous great 1978 vintage Musigny Remoissenet (using Comte de Vogue fruit) with a really special deep mind boggling bouquet and velvet smooth texture. Q.E.D. 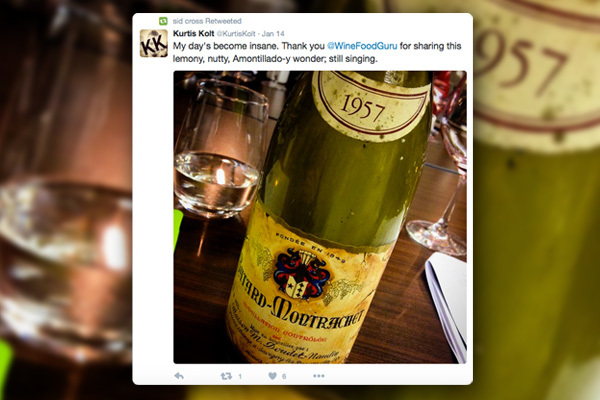 If you have any older bottles of quality pinot noir still around you may be in for an amazing surprise treat indeed!